This is another DVD concert I experienced in the Auditorio Nacional, beside a nice amount of Queen fans from all the ages, with a huge screen and a wonderful sound. 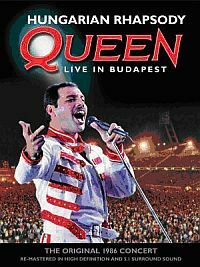 Though this DVD is a concert in almost all its entirety, there are moments where we can see Queen sightseeing in their tour at Hungary, so it is like a brief documentary of the life of an artist days before a show is given in a certain city. So it is nice how the editor of this video decided to intercalate those images and experiences from the band, with the concert. I would have loved to see Queen on concert, what a pity I am too young and could not see them when they visited Puebla, a city near Mexico City long time ago, I am sure it was an unforgettable experience. A experience that produced me goosebumps while watching the concert, since they were a band that really knew how to penetrate the audience deepest whims and make them accomplices of their music. Mercury and co. seemed happy all the time, enjoying what they were doing, singing and playing with great attitude, humor, enthusiasm, power, so the audience can feel pleased, I, as a watcher, am pleased. Songs not that known such as “Tie Your Mother Down”, “In the Lap of the Gods” or “Tear it up” began the show, like a warm up for the people’s throats before they exploded singing tunes of most popular tracks such as “A Kind of Magic” or “Under Pressure” which followed the show. What I really loved is that Queen chose a challenging setlist with songs of different mood and mode, I mean, they turned the concert from happiness to melancholy, from hard rock to ballads, from love to despair. They were always changing so the concert did not really follow an obvious line, they surprised people with an exquisite combination. An example of this was the combo “Now I’m Here” – “Love of My Life” – “Tavaszi Szél Vizet Áraszt”, the last one a traditional Hungarian song that excited the crowd. The performance in general was wonderful, the four members doing their best and as I mentioned above, enjoying their time. With “Bohemian Rhapsody” the concert reaches its pinnacle, and then it will not fall until the very end, so band and audience have full battery, their energy don’t end. In total we can watch and listen to 23 songs, with “Crazy Little Thing Called Love”, “Radio Ga-Ga” and “We are the Champions” (just to mention some) in the last part of the setlist. So if you like Queen, then you will totally love this concert, and have a huge smile at the end, or like me, with a smile, yes, but also with the regret I could not see them live.